Ithaca Fashion Week 2019 presented by Tompkins Trust Company is Here! A weeklong set of activities celebrating the diversity of style and fashion in Ithaca. Pop-up shops, fashion shows, receptions and evening events happening all week and featuring a variety of niche styles from ready-to-wear, handmade, vintage, or sustainable to youth and adult, men’s and women’s styles, too. Show us your style! 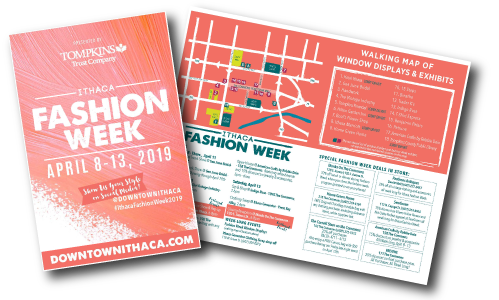 Using Social Media, use #IthacaFashionWeek2019 or tag @downtownithaca. We’ll share the best of the best! Click on the Image to download your copy of the Fashion Week 2019 Program Guide. Check our Ithaca Fashion Week facebook event page for updates. Spring Fashion Window Displays at participating shops. See Facebook Fashion Week page for details. Late Night at The Cornell Store, 6-9pm, refreshments and special savings in store. –Special drinks, Cayuga Chamber Orchestra, Photos, and Pop-Ups! Clothing Swap at Ithaca Generator, 2-6pm – check facebook event for details. Breathe – Enjoy a 20% off the final purchase price on all purchases made in store during Fashion Week. Home Green Home – FREE Original ChicoBag reusable bag with any clothing purchase, excluding clearance items, while supplies last. The Cornell Store on the Commons – 20% off purchases Thursday, April 11th – Saturday, April 13th.Also enjoy a FREE Canvas bag with $50 purchase during our Friday late night event on April 12th. SewGreen – 15% discount on Eileen Fisher Renew and Not Quite Perfect apparel at SewGreen all week long for Ithaca Fashion Week. Check back for a complete schedule – more details coming soon!